The Citizens Electoral Council has issued the following statement for official endorsement, to be published in full-page advertisements in one or more major newspapers in October, along with the names of hundreds of Australian community leaders who endorse this statement. Don’t seize our bank accounts—pass Glass-Steagall! We, the undersigned, are unalterably opposed to the legislation now being drafted to enable the “bail-in” (seizure) of Australian bank deposits as happened in Cyprus in March of this year. The stated purpose of such legislation, in Australia and internationally, is to save the “Too Big To Fail” megabanks whose unbridled speculation has caused the present financial crisis in the first place. But, as in Cyprus, such legislation will plunge this country into mass misery and even worse. There is overwhelming evidence that such legislation is indeed being planned for Australia, as in a 15 April report of the Financial Stability Board (FSB) of the Swiss-based Bank for International Settlements which is overseeing the global bail-in process; that report states flatly on page 5 that such legislation is “in-train” for Australia.1 The FSB and the IMF have classified Australia’s “Big Four” banks as “Systemically Important Financial Institutions”, which must be saved at all costs. 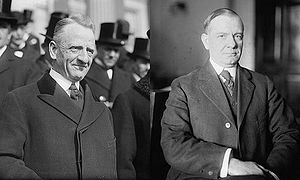 Instead of “bail-in”, the Australian Parliament must pass legislation modelled upon the U.S. Glass-Steagall law which functioned so successfully from its passage in 1933 until its repeal in 1999, which separated commercial banking from investment banking. Without such a separation, banks are free to speculate with customers’ deposits, which, for instance, is why Australian banks now hold some $21.5 trillion in highly risky derivatives. Numerous prominent individuals—even from the City of London and Wall Street—have spoken out to urge the reinstatement of Glass-Steagall, and legislation to do so has been introduced into both the U.S. House of Representatives and Senate, as well as in numerous other countries. Urgent though it be, Glass-Steagall legislation is not sufficient by itself to ensure a recovery of Australia’s actual physical economy. Therefore, we also demand the establishment of a National Bank modelled upon that of King O’Malley’s original Commonwealth Bank, to finance the construction of great infrastructure projects as the cornerstone to rebuild Australia’s once-proud manufacturing industries and its family farms. We say: No to speculation and the seizing of bank accounts; Yes, to rebuilding Australia’s physical economy, with well-paying jobs for any Australian who wants one. Finally, we vow to help to drive from office any Australian Member of Parliament who signs his or her name to legislation for bail-in, but to likewise do all within our power to support any MP who sponsors or votes for an Australian Glass-Steagall bill, and for a National Bank. Click here to add your name and position to the list of endorsers to be published with the statement in major newspaper ads. The CEC urges all current and former community leaders—including elected MPs, local councillors, leaders of business and trade groups, farming organisations, chambers of commerce, service groups, trade unions, charities, churches, synagogues, mosques and temples, educators, activists, legal experts, media professionals, et al.—who oppose the planned bail-in law to endorse this statement. This entry was posted in News Archive and tagged Australia, Citizens Electoral Council, Financial Stability Board, Glass-Steagall, Glass–Steagall Act, National Bank, United States House of Representatives, Wall Street by renaissancelearningfoundation. Bookmark the permalink.